Description: This is a McDonald's® pretend food set that includes a Chicken McNuggets meal. Designed for children ages 3 to 7 years old. 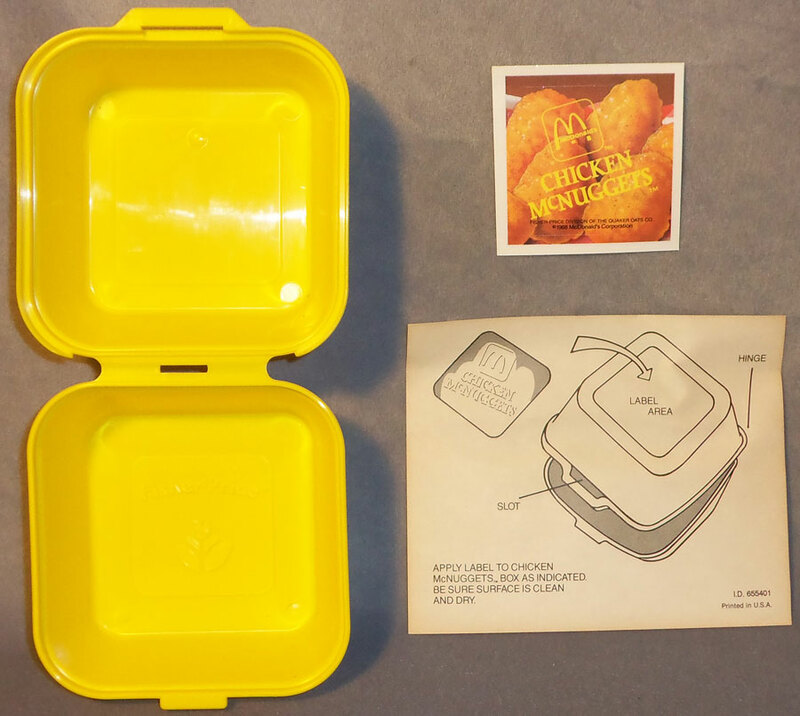 FPT7054 - Yellow square plastic hinged "styrofoam" Chicken McNuggets box with a picture on top of McNuggets. This looks exactly like the container that real Chicken McNuggets are sold in at a McDonald's restaurant. 6 each - FPT7055 - Light brown plastic Chicken McNuggets that is shaped and textured exactly like a real McDonald's Chicken McNuggets. FPT7056 - Small white plastic rectangular container with a flip-up lid and a picture on top of the lid marked "McDonald's BBQ SAUCE" in yellow. FPT7018 - Red plastic "large fry" container with a yellow M and white "McDonald's" within a white square box on the cover. 3 each - FPT7019 - Yellow bundles of plastic french fries molded together. Each bundle has about 6 fries. FPT7057 - This set was sold in a 8-7/8" long, 9-7/8" high, 2-7/8" deep display box. The Fisher-Price Dealer Catalogues do not picture the french fries and fry container with this set, however boxed sets do include these pieces. 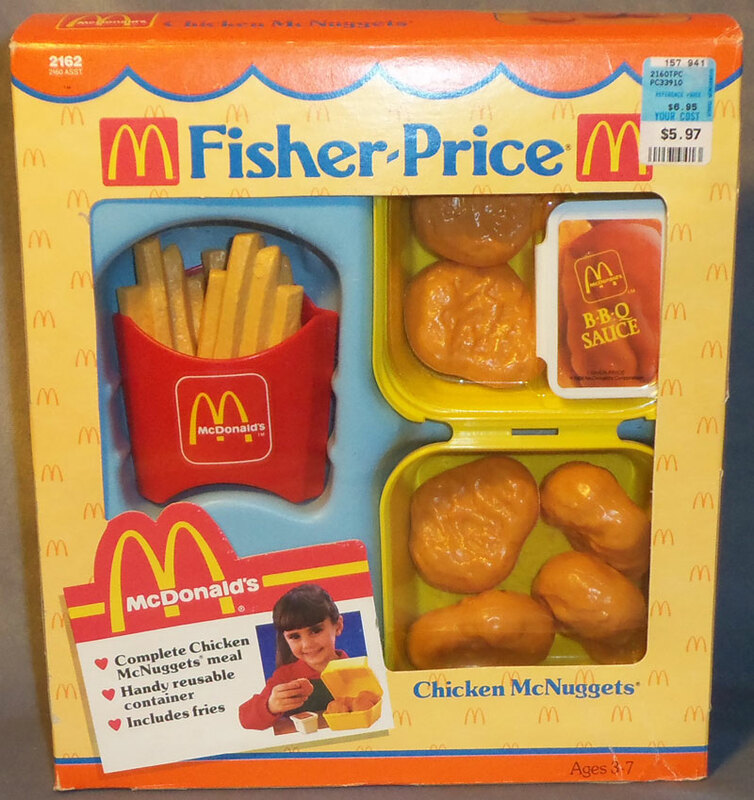 1989 - This set was sold in #2160 McDonald's® Menu Assortment. 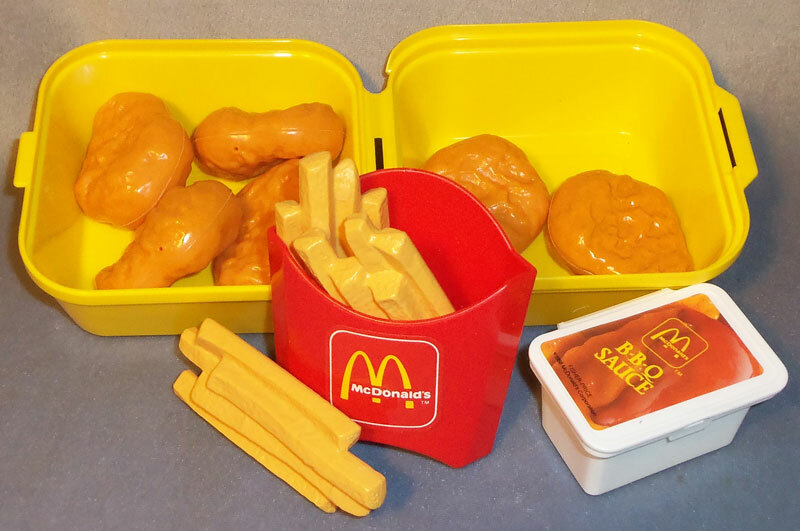 1990 - This set was sold in #2165 McDonald's® Fast Food Assortment. Big Mac, Golden Arches, McDonald's, Happy Meal, and Garden Salad are trademarks of McDonald's Corporation and were used with permission.